The tibia is the main bone of the lower leg, forming what is more commonly known as the shin. It expands at its proximal and distal ends; articulating at the knee and ankle joints respectively. The tibia is the second largest bone in the body and it is a key weight-bearing structure. In this article, we shall look at anatomy of the tibia – its bony landmarks, articulations and clinical correlations. The proximal tibia is widened by the medial and lateral condyles, which aid in weight-bearing. The condyles form a flat surface, known as the tibial plateau. This structure articulates with the femoral condyles to form the key articulation of the knee joint. Located between the condyles is a region called the intercondylar eminence – this projects upwards on either side as the medial and lateral intercondylar tubercles. This area is the main site of attachment for the ligaments and the menisci of the knee joint. The intercondylar tubercles of the tibia articulate with the intercondylar fossa of the femur. 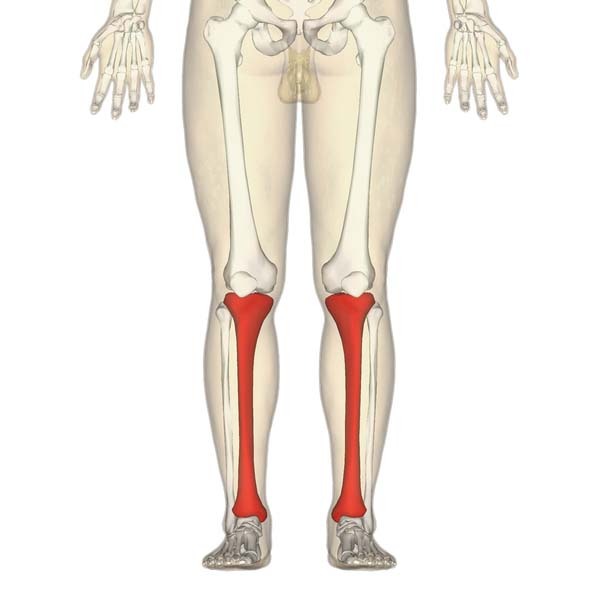 Fig 2 – The tibial plateau. The tibial condyles articulate with the femoral condyles to form the knee joint. The shaft of the tibia is prism-shaped, with three borders and three surfaces; anterior, posterior and lateral. For brevity, only the anatomically and clinically important borders/surfaces are mentioned here. Anterior border – palpable subcutaneously down the anterior surface of the leg as the shin. 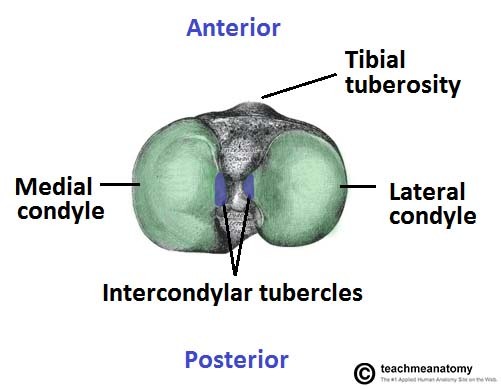 The proximal aspect of the anterior border is marked by the tibial tuberosity; the attachment site for the patella ligament. Posterior surface – marked by a ridge of bone known as soleal line. This line is the site of origin for part of the soleus muscle, and extends inferomedially, eventually blending with the medial border of the tibia. There is usually a nutrient artery proximal to the soleal line. Lateral border – also known as the interosseous border. It gives attachment to the interosseous membrane that binds the tibia and the fibula together. Fig 3 – Bony landmarks of the tibial shaft. Intraosseous access is a form of vascular access used in the emergency setting. It allows the administration of fluids, blood products and medications directly into the bone marrow. Complications of IO access include osteomyelitis, iatrogenic fracture and compartment syndrome. IO infusions should be discontinued when IV access has been achieved. The distal end of the tibia widens to assist with weight-bearing. 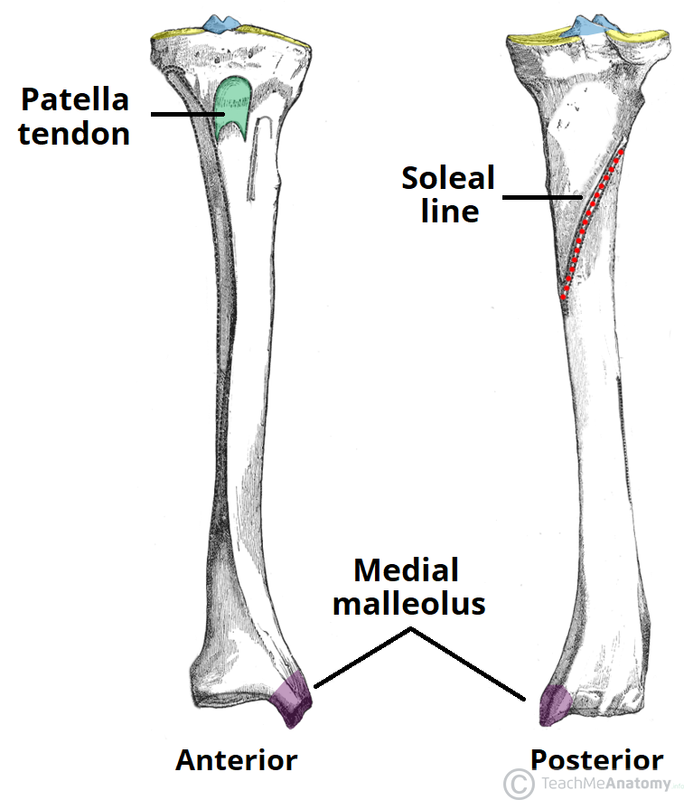 The medial malleolus is a bony projection continuing inferiorly on the medial aspect of the tibia. It articulates with the tarsal bones to form part of the ankle joint. On the posterior surface of the tibia, there is a groove through which the tendon of tibialis posterior passes. Laterally is the fibular notch, where the fibula is bound to the tibia – forming the tibiofibular joint. High energy trauma – occurs predominantly in the younger population. Low energy trauma or insufficiency fractures – occurs predominantly in the elderly. Fractures most commonly occur at the shaft of the tibia, and are typically associated with fibula fractures. Fractures of the proximal tibia are known as tibial plateau fractures; the condyles may be broken and injury to the menisci and ligaments of the knee is not uncommon. These fractures are classified using the Schatzker classification, and if very displaced will likely required operative management. It is important to monitor patients for signs of compartment syndrome in the pre-and post-operative phases. At the ankle, the medial malleolus can be fractured. This is caused by the ankle being twisted inwards (over-inversion) – the talus of the foot is forced against the medial malleolus, causing a spiral fracture. This rarely happens in isolation and typically the lateral malleolus is also fractured; potentially producing an unstable fracture that requires operative management. 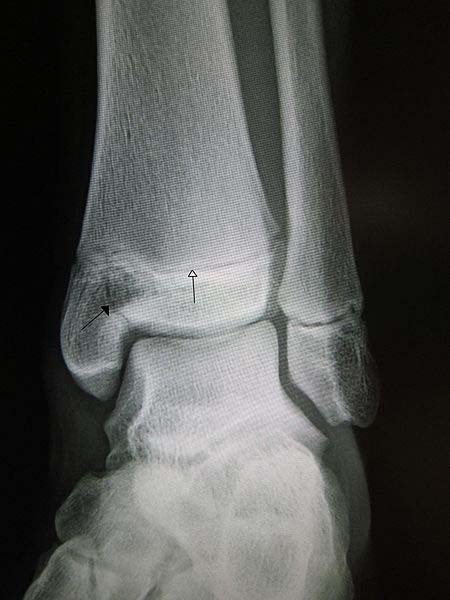 Fig 4 – Fracture of the medial malleolus (black arrow) in a child, with the whiting arrow marking a normal growth plate. This is a Salter Harris type III fracture. At the knee joint, which structure articulates with the tibial condyles? Which bony landmark of the tibia is the site of attachment for the anterior cruciate ligament? The flat surface formed proximally by the tibial condyles is known as the _______________ ?